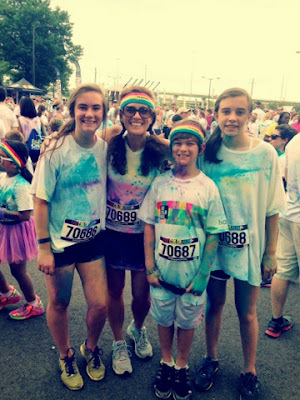 BamagirlRUNS: The Color Run Birmingham, Al....A Super FUN Race with my kids! The Color Run Birmingham, Al....A Super FUN Race with my kids! 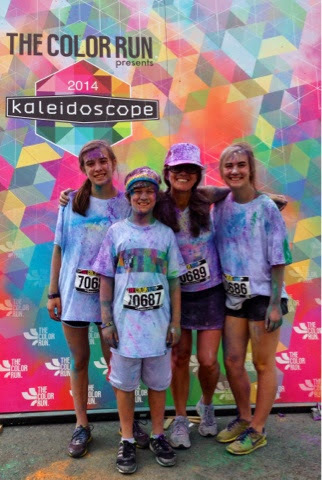 Me and my kiddos at The Color Run Kaleidoscope 2014 Tour. 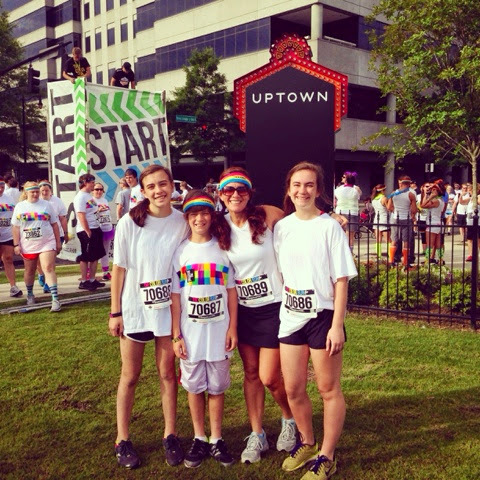 Last Saturday my kids and I set out for The Color Run! It was a very last minute decision to go run the race and we've done this race before so we knew it would be a blast. 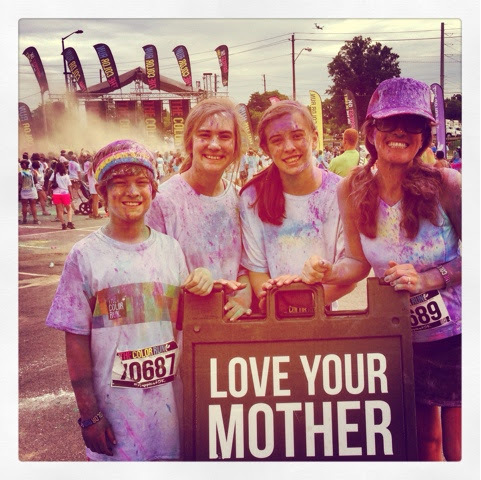 One thing I know about my kids is that they like to run, get messy and eat. I have found the PERFECT race for them. We started out in our "all white" clothes. 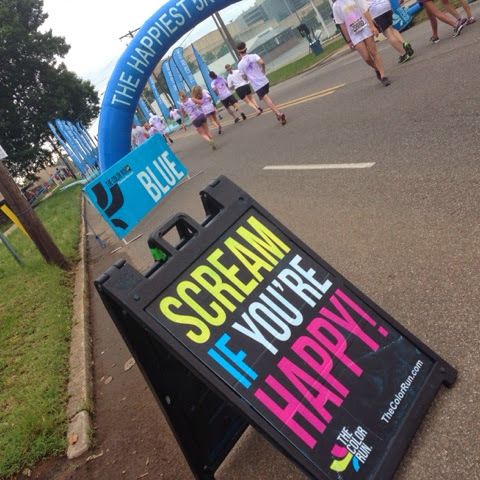 On our way to the #Happiest5k on the planet! Got our swag bags in our "whites". 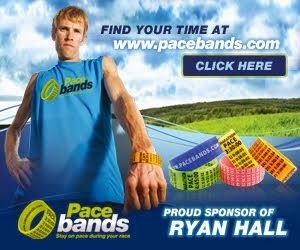 This kid is all about the race swag. He put everything on! 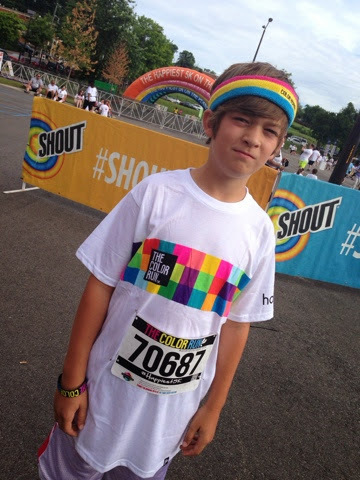 The shirt, the armband, the headband,....he's ready! Making our way over to the Start Line of the The Color Run in Uptown Birmingham, Alabama. Here we go Long Family...Let's do this! The untimed race started at the new Uptown Birmingham venue adjacent to the BJCC and Alabama Sports Hall of Fame. 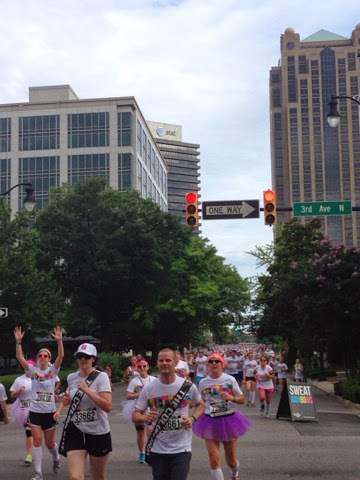 The run itself actually took place in the downtown streets of Birmingham passing through four "Color Stations", YELLOW, PINK, PURPLE and BLUE. 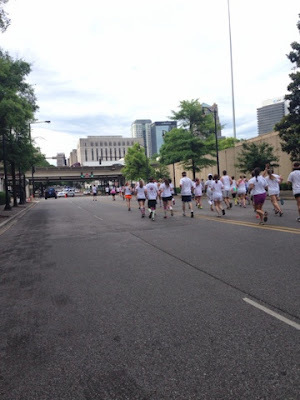 We took off running right past the BJCC, heading to the streets of Downtown Birmingham and making our way to the "Yellow". Running towards Downtown...no color yet! Running past 3rd Ave. North just before the Yellow Stop! 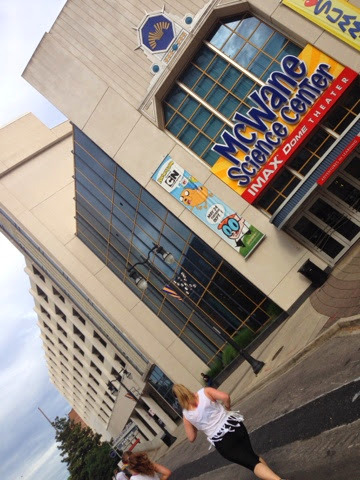 Running past the McWane Science Center...on our way to the Pink! 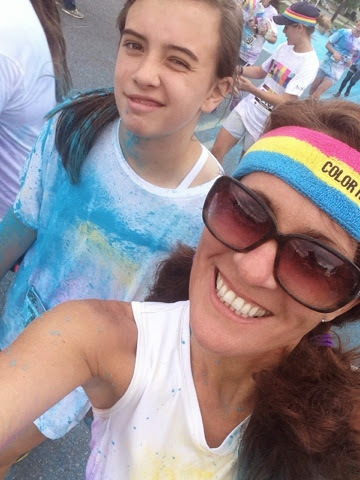 she was holding her breath trying not to get the color in her face! Love all of the signage through the race....On to the BLUE!!! They got her good in the BLUE!! 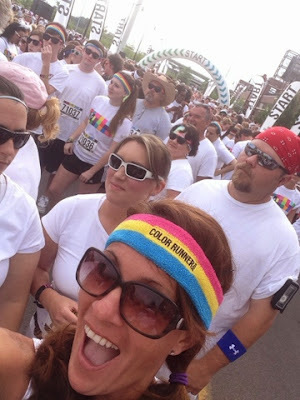 My Lindy and Justin had left me and Alyssa at this point and were already at the Finish Line. 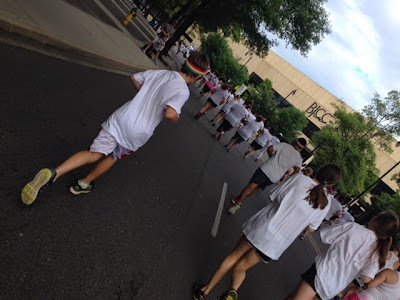 Since this was an untimed race, we felt no pressure to run fast. 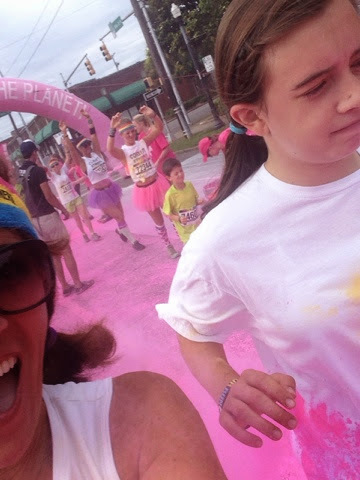 We took our time, played in the color, had fun and were headed to the Finish Line to find my other kids! 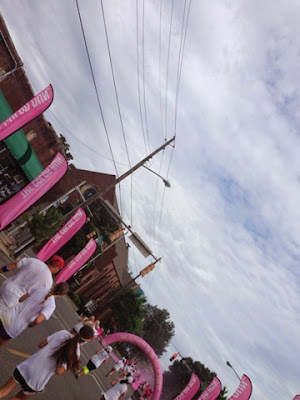 The Rainbow Finish Line Chute! Too Fun! 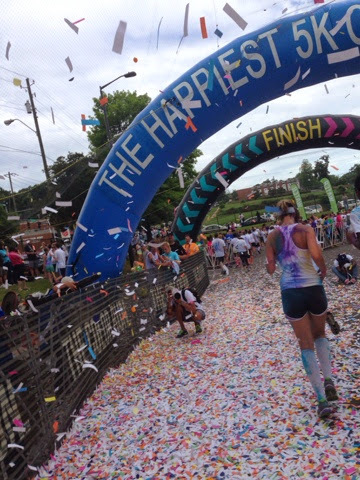 Running through the Finish Line...Love all the confetii! This is how we looked right after the run....not too messy. 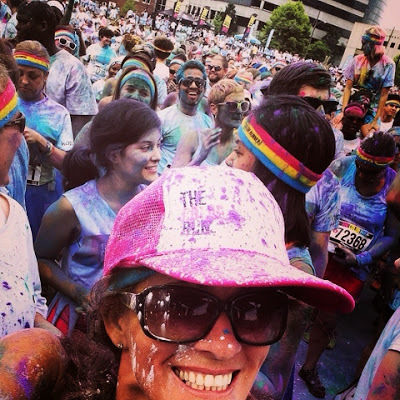 As soon as we crossed the Finish Line, we headed over to the stage area for the "Color Throw". 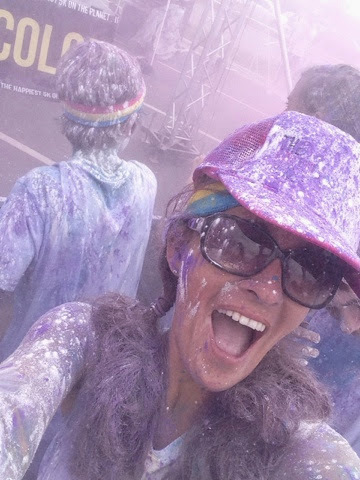 The DJ was throwing out packets of color into the crowd and we could throw it up all at once! 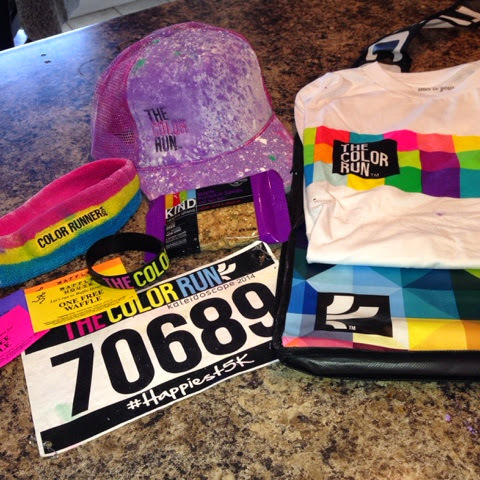 We managed to find ourselves on the front row, caught lots of color and a trucker hat for mom! 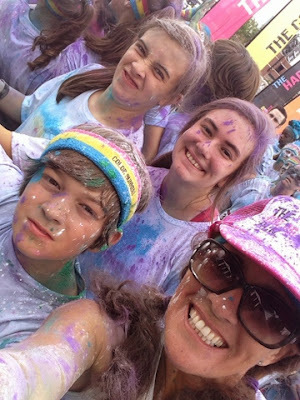 We were drenched with color and were having a BLAST!!! The stage was set.....going to the front! My kids stayed until the very last color throw and didn't want to leave. 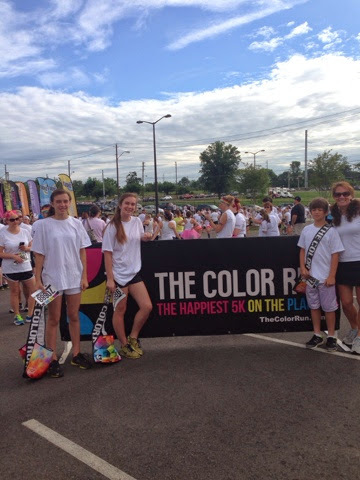 We were a HOT COLOR MESS!! Love it. We had to get in the middle of it! My kids waiting for more color to be thrown! After the first Color Throw...getting messier! This was the scene behind me, a sea of color runners!! 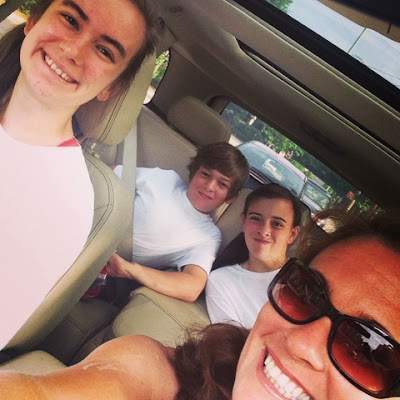 I would be lying if I said that my kids had the most fun! 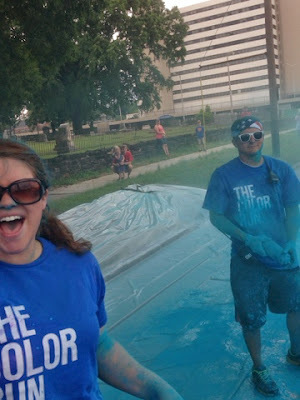 This was the end result after hanging out in the Color Throw! Color from Head to Toe! We were ready to head home and stopped to take a few more pics. Every year the Color Run has a different themed tour. 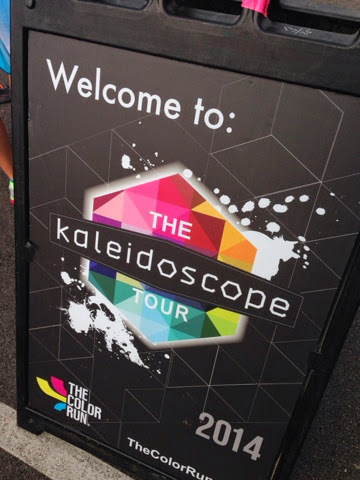 This year, it's the Kaleidoscope Tour. I really wasn't sure what that meant at first. I thought it was just a Kaleidoscope of Color kind of thing. But when we stopped for photos, I realized that there were some pretty cool Kaleidoscope photo opps. Welcome to the Kaleidoscope Tour 2014. 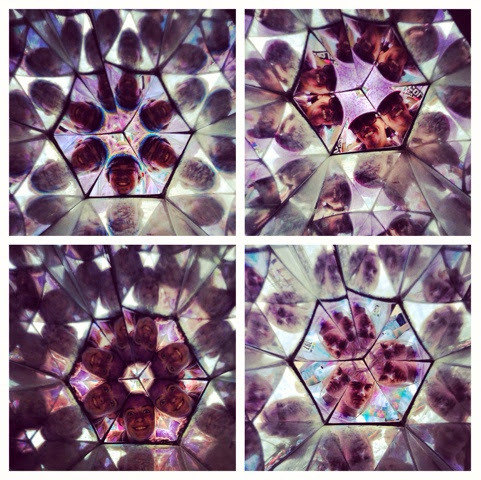 Our finished product Kaleidoscope pic collage! Okay. Now we are ready to go!!! 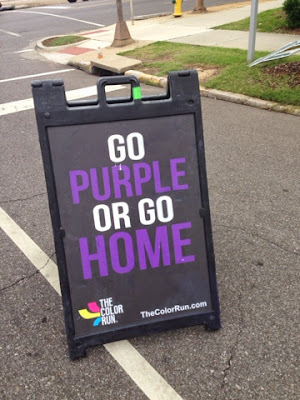 Ever wonder how people get most of the color off to get in their cars to go home??? Thanks to Shout, there's this guy with a blower standing at the exit just waiting to dust you off. We still used towels to sit on...I'm telling ya, we were a Colorful mess!! This guy might just have the best job on the planet! 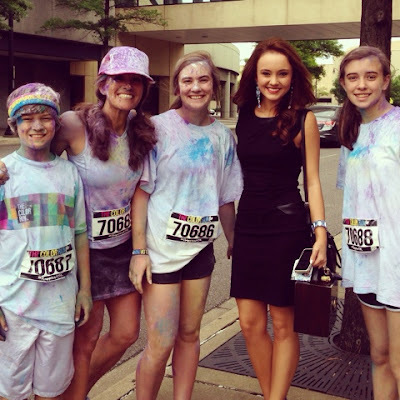 Walking back to our car, we ran into Miss Alabama! We promised not to touch her if we got a quick pic with her...She was so beautiful and clean! Headed home but first, let me take one last Selfie! We got home, got showered up and were ready for the rest of the day! 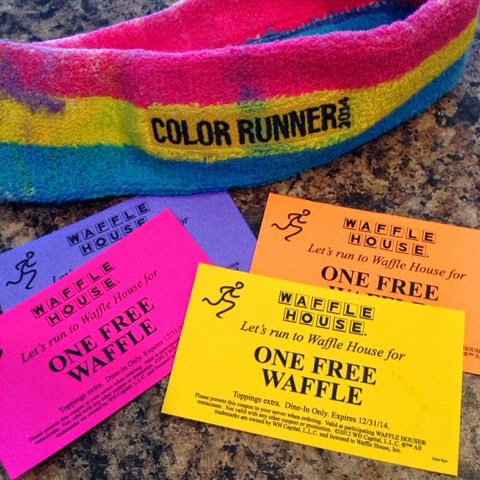 Take a look at our swag....We got coupons for Free Waffles at The Waffle House! My kids were super excited about that!! 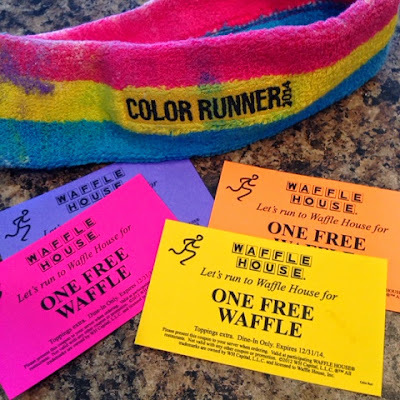 Best Race Swag Ever!!!! All of our race goodies....Kind Snacks are some of my faves! 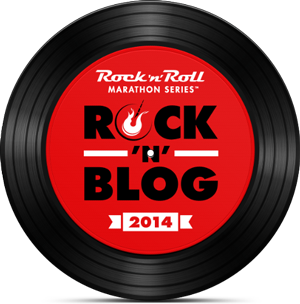 Remember that Reality Show Reference in the beginning of this blogpost??? Yep. This was the scene in my driveway later that same afternoon. 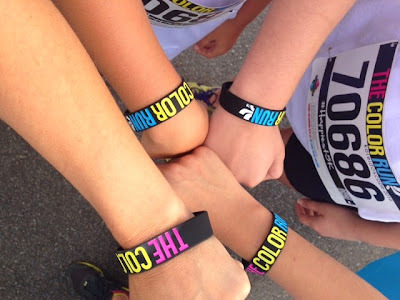 As me and my kiddos were running this race, my hubby was at home tearing the house apart looking for his keys and wallet that he thought he had lost. After we got home, I called the police, he called Pop-A-Lock, they both show up at the same time, start arguing over who wants to get the truck unlocked. (We were sure that he had locked them in his truck.) Geez Laweeeez. We get the truck unlocked, the alarm goes off forrrrrrrrever, the neighbors are all coming out. Of course, NO keys or wallet found in the truck. We look allllllllllll weekend in the house, hubby pays the kids and grandmother 20 bucks to dig through all of the weeks' trash, still no keys and wallet. We have now paid $71.30 ($51.30 to Pop a Lock and $20 to our kids). Still no keys or wallet. 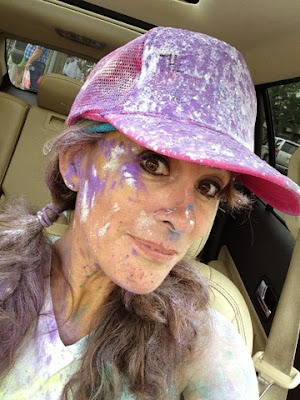 I tear my bedroom apart Monday morning, rearrange the furniture and finally find them underneath a stack of white t-shirts that we had gotten out late Friday night to wear to the Color run. As usual, Mom finds everything. So yeah, Reality show is an understatement!!!! 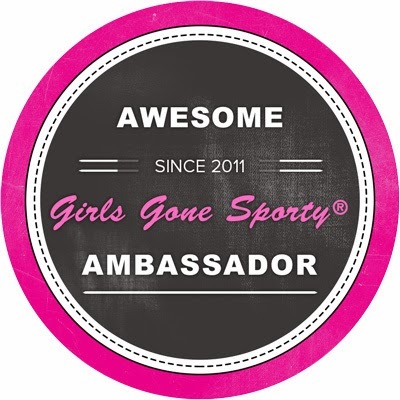 Happy Running and go have FUN with your kids! **Have you ever done a non-timed FUN run with your kids?? Healthy Kids Snack! It's Smoothie Time! Dopey Challenge/Chicago Marathon Training Update!